When young Lili is forced to give up her beloved dog Hagen, because it's mixed-breed heritage is deemed 'unfit' by The State, she and the dog begin a dangerous journey back towards each other. At the same time, all the unwanted, unloved and so-called 'unfit' dogs rise up under a new leader, Hagen, the one-time housepet who has learned all too well from his 'Masters' in his journey through the streets and animal control centers how to bite the hands that beats him. Creating a truly engaging, multi-faced character on screen is no easy task under any circumstances -- but when that character happens to be covered in fur and walks on all fours, the job can be a bit more daunting. 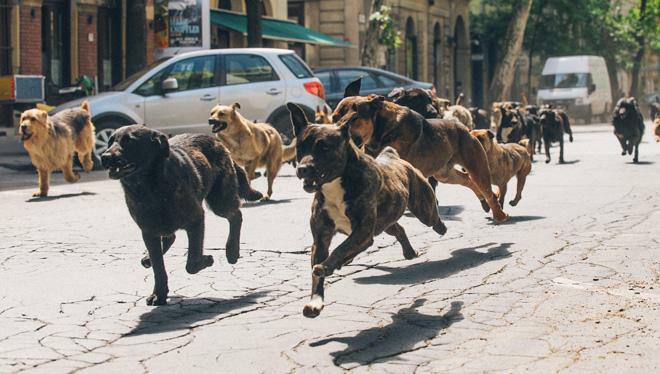 Featuring a cast of humans and dogs alike, 'White God' becomes a striking cinematic parable and an impressive technical feat. Through its arresting story of friendship, exploitation, and revenge, the film weaves a powerful allegory and a genuinely gripping tale of suspense -- one whose success or failure ultimately rests squarely on the shoulders of its canine leads. A young girl, Lili (Zsófia Psotta), is forced to abandon her beloved dog, Hagen (Body & Luke), when her strict father refuses to pay a fine for its mixed-breed background. Devastated, Lili attempts to find the lost animal. Meanwhile, poor Hagen must learn to survive on the streets with the other stray mutts, constantly under the threat of capture and harm. But when the dog finally strikes back, he leads a rebellion that could put his former friend in danger. As the runtime evolves, the narrative offers a simple yet powerful story full of engaging drama and rich (albeit not terribly subtle) metaphors and subtext. On the surface, the movie works as a purely literal tale about a young girl traversing her own personal growing pains, and an abused dog who incites a violent rebellion. To this end, the parallel stories of Lili and Hagen offer affecting coming-of-age moments coupled with a rather disturbing expose on animal cruelty. A little deeper under the surface, however, the script also tackles broader metaphors related to ethnic discrimination, racism, and classism, allowing the dogs' plight to stand-in for human struggles. Mixing genres, the film gradually and organically shifts gears, naturally evolving from a family drama into an adventure story, a suspense thriller, and even a horror revenge flick. With this in mind, the climax heavily recalls previous efforts like 'Rise of the Planet of the Apes' and Hitchcock's 'The Birds.' All the while, the focus is split fairly evenly between the human characters and their canine co-stars -- allowing us to see the story unfold from both perspectives. But unlike many other movies, these animals are not CG images or motion captured creations. Instead, director Kornél Mundruczó and his team of expert trainers have employed an ensemble of about 280 actual dogs, and the level of emotion and drama that they are able to elicit from their four-legged performances is nothing short of astounding. Serving as the film's central canine protagonist, Hagen proves to be a rather complex character -- something made all the more impressive considering that his only means of communication is through barking. The dog is given a rather meaty arc that sees the character develop in painful, tragic ways, mirroring many similar human tales of exploitation and revenge. 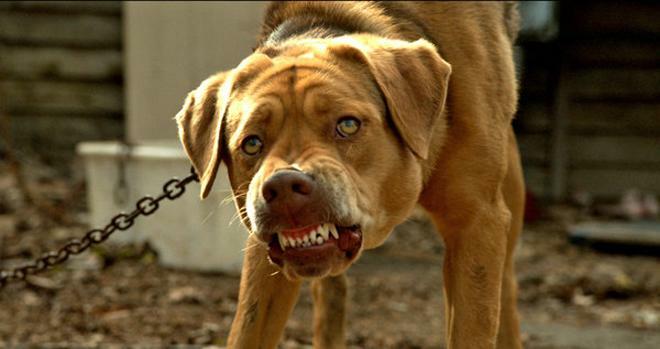 We gradually bear witness to Hagen's mistreatment, and through his terrible journey the dog is forced to become more aggressive and violent, resulting in a morally grey conclusion that evokes complicated levels of empathy and anger from the audience. On the one hand, we feel vindicated by the dog's rebellion after witnessing his suffering, but on the other, we feel disturbed by the heartbreaking loss of innocence that this once friendly animal has had to endure and by the deadly methods he now follows. To place audiences within the human and animals' mindsets, the director employs a mostly handheld visual style that offers numerous low angle shots and dog POVs. Likewise, a few comparatively dreamy, smooth moving shots and more painterly compositions are mixed in as well, including the film's beautifully haunting opening and closing sequences. And from a purely logistical perspective, the work gone into capturing and editing the dogs' performances (without mistreating them, as the special features elaborate on) really deserves special note, as I can't really think of any other movie that has attempted to do something of this scale and emotional impact with this many real animals. Yet even beyond the remarkable technical feat on display here, 'White Dog' is made all the more impressive by the sheer fact that it even works as a compelling and cohesive narrative at all. Taken at face value, the premise is rather ridiculous and potentially laughable, and there are numerous instances where, under lesser hands, the film would have completely collapsed into unintentional laughter or empty sensationalism. Instead, thanks to the director's steady vision, the movie's tone is able to remain serious and affecting. A potent parable about humanity's precarious relationship with animals, nature, and itself, and a bittersweet story about friendship and retribution, the movie works on multiple levels -- creating a fascinating examination of man and man's best friend. 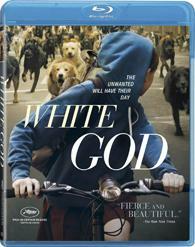 Magnolia Bay brings 'White God' to Blu-ray on a single BD-50 disc that comes housed inside a standard keepcase. After some skippable trailers, the disc transitions to a traditional menu screen. The packaging indicates the release is Region A coded. The movie is provided with a 1080p/AVC MPEG-4 transfer in the 2.39:1 aspect ratio. Sharp and nicely stylized, this is a very impressive video presentation. Shot on the Arri Alexa digital camera, the source looks pristine with a light layer of grain-like noise that gives the picture a surprisingly filmic appearance. Clarity is very strong, offering sharp textures, fine details, and life-like dimensionality throughout the film's mix of striking compositions and visceral handheld shots. Colors are slightly subdued but still rich, and whites are bright without blooming. Contrast is well balanced, and black levels are deep and inky with great shadow delineation. Outside of some very fleeting shimmering, there are no troublesome artifacts to report. 'White God' is a visually powerful film, and thankfully this Blu-ray release provides a top-notch video transfer. The film is presented with a Hungarian DTS-HD MA 5.1 track along with English, English SDH, Spanish, and French subtitles. Delicately textured, the mix offers an immersive and varied experience. Dialogue is clean and easy to hear throughout with no balance issues. The soundstage often features a subtle but nuanced layer of background ambiance, gently spreading birds, passing cars, falling rain and other appropriate effects around the room with minimal but effective surround use. Directionality is natural with smooth imaging and pans (dog barks transitioning from the left to right, for instance). The track also perks up nicely during the movie's more aggressive moments (like a disturbing dog fight), demonstrating good range. Music comes through with great fidelity and separation as well, and bass activity kicks in when called for (a crowded bar and club offer approximately boomy low frequencies). With understated design work, the track offers a fairly enveloping experience that helps to enrich the world and keep the story grounded. Magnolia has provided a slim but decent collection of supplements, including some worthwhile interviews with the filmmakers who shed light on the movie's impressive production. All of the special features are presented in 1080p with Dolby Digital 2.0 audio and English subtitles for the foreign language portions. Behind the Scenes of White God (HD, 17 min) – This featurette features on-set footage and interviews with the cast and crew. The participants discuss the idea behind the story and share details about how they got the dogs to appear distressed and aggressive without endangering them or mistreating them. Interview with Writer/Director Kornel Mundruzco (HD, 15 min) – Here, the director talks about his motivations, the title's meaning, the movie's themes, the necessity for violence in the story, and his decision to rely on actual animals rather than CG. Interview with Animal Coordinator/Technical Advisor Teresa Ann Miller (HD, 5 min) – In this featurette, Miller elaborates on the dog casting process and the challenges of working with 280 dogs. Kornél Mundruczó's 'White God' is a gripping and affecting parable about humanity, animals, nature, exploitation, revenge, and friendship. On a purely technical level, the film's use of actual dog performers is nothing short of astounding, and thankfully the narrative and visual filmmaking are just as impressive. The video transfer and audio mix are both excellent, providing an immersive experience. Though not packed with supplements, the included featurettes are very worthwhile, offering details on the movie's remarkable production. Despite what its potentially ridiculous premise might have one believe, this is a powerful and serious piece of cinema. Recommended.